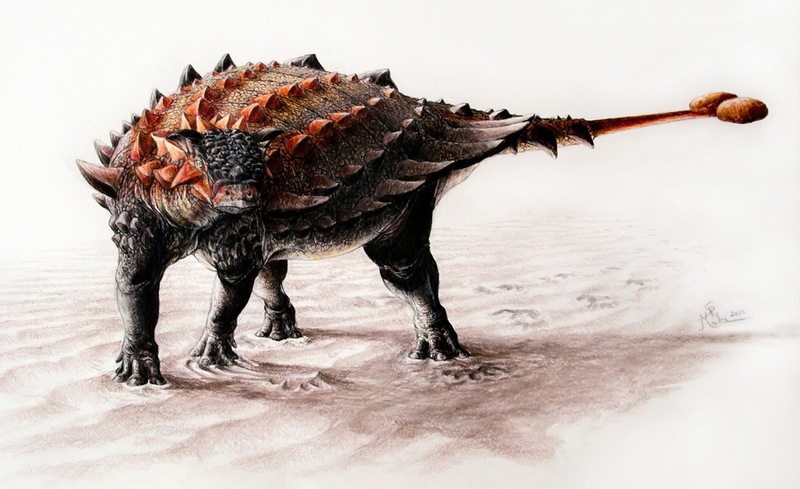 Sydney Mohr is a friend and colleague of mine whose art you will have seen in the news lately, if you are inclined to read about ankylosaurs. She’s done amazing reconstructions of two ankylosaurs for me in the last year – Ziapelta and Gobisaurus – and so I asked her to take a few minutes and tell us about her process for creating her palaeoart. Also this way I get to show off more of her drawings, so yay! Sydney decided that this Gobisaurus was named Burger, and that seemed fine with me. Once we got started on Gobisaurus, I sent Sydney a pile of photos of both Gobisaurus and its close relative Shamosaurus, and some of my own very rough sketches of what the osteoderms might have looked like. Gobisaurus isn’t completely known, so we’re guessing a bit on the osteoderm arrangement in the final version and using Shamosaurus for the cervical armour. 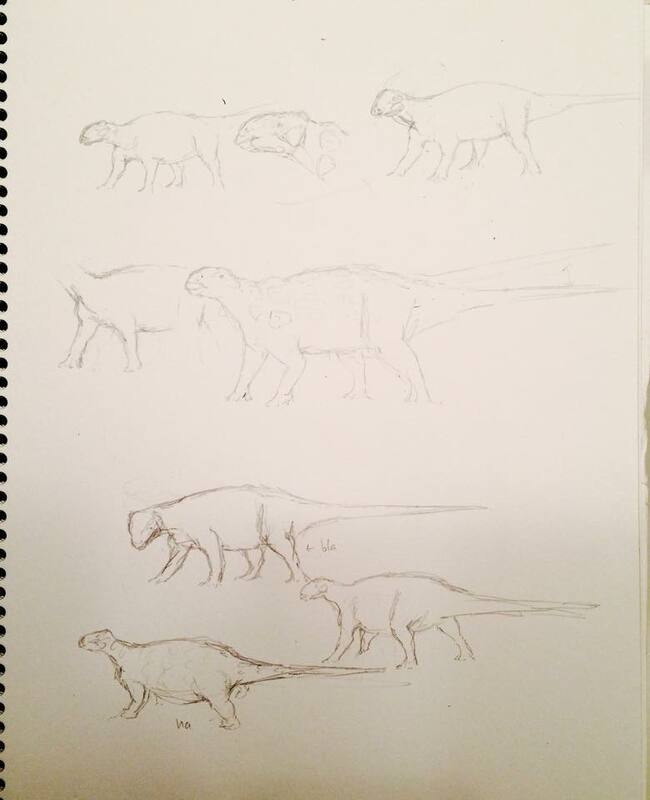 Here are the earliest sketches Sydney sent me – so many great poses and personality. Also, here’s a Sydney in her natural habitat (thanks John Acorn for the photo!). One of the things I really like about your art is that it’s obvious you are very familiar with animal anatomy and behaviour – your dinosaurs have real animal personalities. Can you tell us about some of your inspirations for your palaeoart? The best inspiration any artist can have when reconstructing extinct animals are…living animals! In most cases that’s the best if not the only source of reference we have, at least when it comes to external appearances. Depending on what type of fossil I’m drawing, I’ll try to find an extant analogue/s that may share some characteristics, like habitat and environment, diet, colour scheme, etc. For colour in particular I often mix and modify schemes from two or more animals, all the while keeping the fossil’s apparent paleobiology and habitat in mind. I’ll peruse images of modern animals on the web to get an idea of the posture and stance I want the fossil animal to be in, as well as the lighting and angle. A lot of a creature’s emotion comes from the face, so I really like to focus on eyes. Getting the shape, depth, colour, and light just so can make a huge difference in terms of giving a drawing personality. It also isn’t a bad idea to look at other artist’s work, obviously not to copy directly, but you might get ideas for new methods or techniques that you can adopt and fit into your own style. 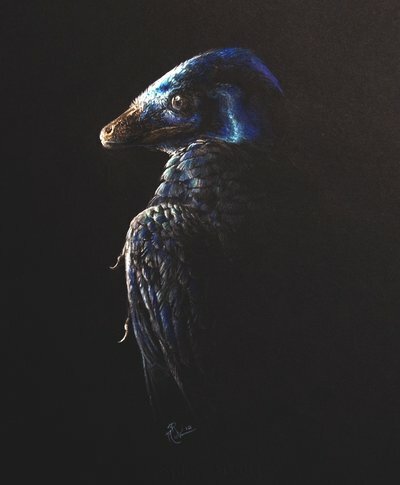 Mr Iridescent – a beautiful take on Microraptor. So shiny and chrome. This reminds me, I think you said the Ziapelta reconstruction you did for our paper was inspired by a photo of a bird that you took! And that in turn reminds me that you are also a pretty great bird photographer – do you find that you get a better sense for conveying personality and movement in your dinosaurs by observing birds in the wild yourself? So I did! 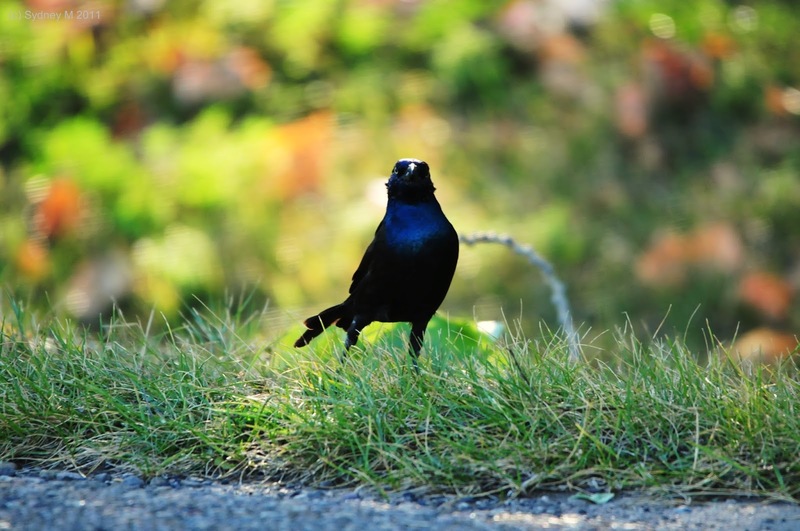 The proudest grackle ever! I can see the family resemblence! Also, when I found out the Gobisaurus was named Burger, I asked if the Ziapelta had a name. Naturally, it was Hot Dog. And definitely, seeing any animal in their habitat first hand can create a narrative in your mind that you can translate to paper. Birds are great to watch because a lot of the time they’re always on the move and engaging in a variety of behaviours that are both interesting and fun to watch, as well as perfect fodder for a dinosaur reconstruction. You are also working on a Masters with Phil Currie at the University of Alberta! Would you like to tell us about what you’re working on? The thought of Mesozoic birds with bonafide teeth has really interested me for a while, so the plan is to explore the evolution of tooth loss in birds by comparing the implantation and replacement rates of small theropod (like dromaeosaurids and troodontids) and bird teeth. Looking into the anatomy of the jaw and the inner structures of the teeth of these closely related groups will hopefully yield some informative results. It’s not easy because the stuff I need is comparatively rare and pretty darn tiny! I’m working entirely with Alberta material at the moment, and doing so has led me in other directions in terms of understanding the province’s Cretaceous avian fauna, which is most represented in terms of numbers by, you guessed it, teeth! Pygostylia Panoply: at the bottom, the toothy Early Cretaceous enantiornthine Rapaxavis, and up top, the duck-like (and toothless) Presbyornis. Do you have a favourite taxon to illustrate? Birds and feathered theropods are definitely up there.The more I do ankylosaurs though the more I enjoy drawing them. 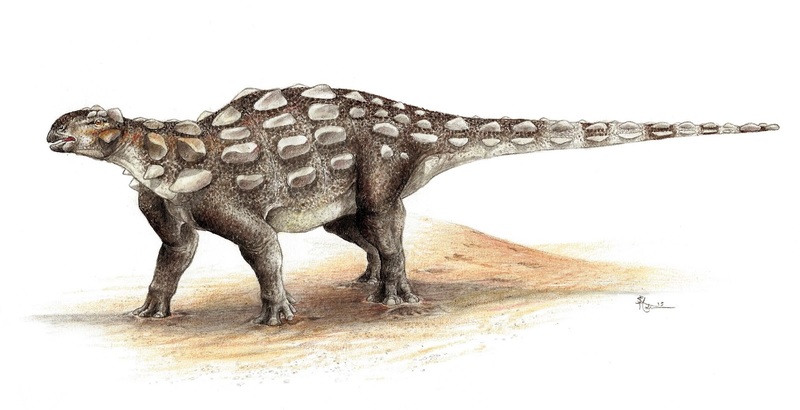 [YES FOLKS, YOU HEARD IT HERE: ANKYLOSAURS > THEROPODS.] They’re so unique compared to anything else around today! I also enjoy doing mammals as well, like ungulates and carnivores (fossil or modern) and primitive examples from the Mesozoic. I am but a young’un: a perfectly floofular dromaeosaur chick. What medium/media do you like to work in? 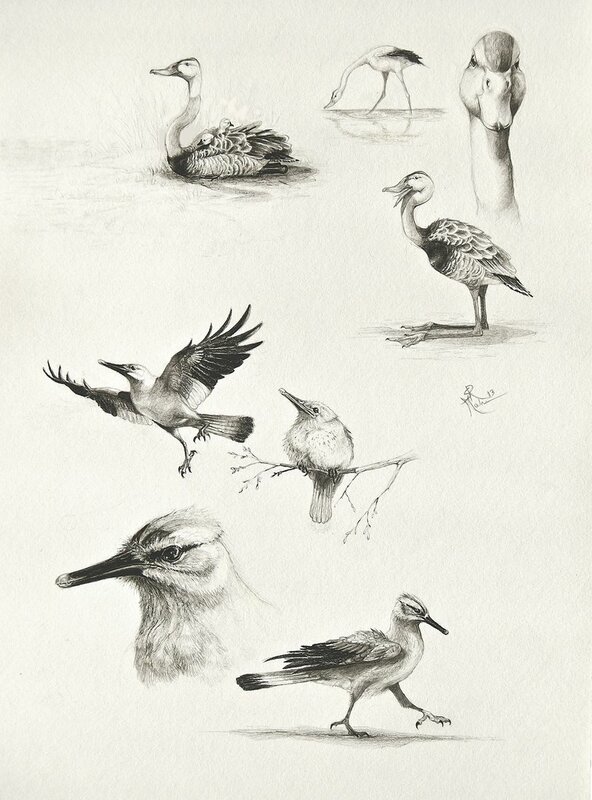 I stick almost exclusively to traditional media; mainly pencil work, both black and white and colour, although I occasionally work in acrylic or watercolour. I prefer to work with fine tooth paper so I can vary my pencil strokes, blend more easily, and just have an overall smoother surface to work on. Coloured paper is also really fun to work with, like blue or black, because it makes drawing ocean scenes with pencil pretty simple. I’ve also dabbled in digital art via photoshop, but most of the time I only use it to fix mistakes and touch up scanned pencil drawings. In my case I find I have much more control with pencil and paper, and the results seem to be a bit more realistic, at least to my eyes. 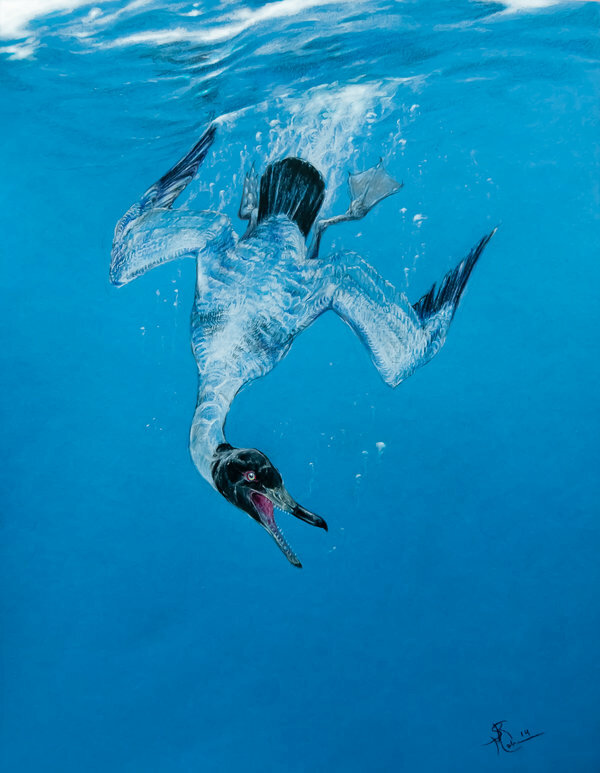 Ichthyornis dispar: a classic fossil bird, brought to life! 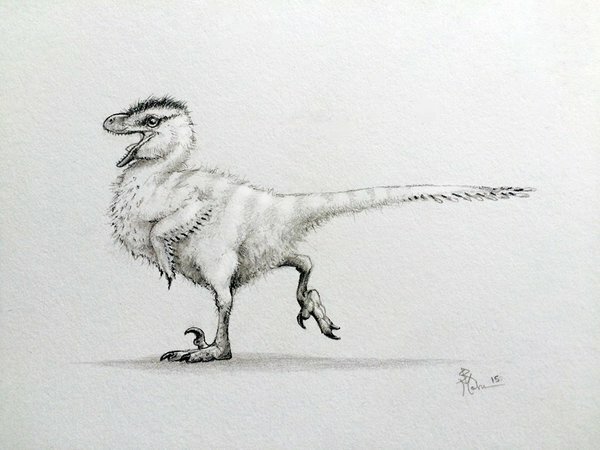 Do you have any advice for other people who are interested in creating their own palaeoart? Any common pitfalls to avoid, or things to think about when they are recreating an extinct animal? I think one of the most important aspects of reconstruction is attention to detail, such as the dot of light and reflections in an eye, or the wind disturbing and ruffling fur or feathers, or the bulge of a muscle as a limb is flexed, or the crumpling of skin as it moves in a certain direction or shifts under the weight of the animal. Light, movement, and substance. Those kinds of little and almost unnoticeable features can take a simple reconstruction of a fossil to something that feels tangible and alive. In terms of pitfalls to avoid, I would say there isn’t too much to worry about if you’re just playing around and having fun, because hey, it’s just art! That being said, if you’re going for a publishable, as-accurate-as-possible, realistic style of depiction, then it’s a good idea to become familiar with your subject, especially anatomy. If you can read up and get as close as possible to the original source material, like scientific papers, then you’re that much closer to getting your skeletal anatomy down pat. Knowing some anatomy of modern animals is extremely helpful as well, as it informs how muscle and skin attaches to the bone and changes the outline of the body. Thanks Sydney! You can check out more of Sydney’s amazing art and photography at her website, DeviantArt gallery, and Flickr gallery. Wow! Great work! Thanks for sharing Sydney with us, Victoria!